Daily need to have better-looking eyes can be seen from the way ladies consider using their mirrors before getting out of their rooms. It gives a reflection of their true self. This may be boosted especially in the areas around the eyes by applying appropriate cream within the eye contours. Here is a consideration of LUSCIOUS Under Eye Cream which is claiming to give a lot of support in the eyes. What is LUSCIOUS Under Eye Cream? This is a naturally formulated anti-aging eye cream for boosting the look of the skin areas around the eyes. The cream is addressing a lot of conditions which one may need to boost in their faces starting from the removal of fine lines and wrinkles. It is also having the components which are enabling better boost in the skin around the eyes. Puffiness and the fine lines may as well be solved by using this cream, hence the users of this cream are benefiting from using a single cream to gain a plethora of benefits. Who is the Manufacturer of LUSCIOUS Under Eye Cream? The company which is making this natural formula is known as Coui Skin Care. This is a company which has been formulating such formulations for a long time. The company is, therefore, having the desired bulk of knowledge in designing the best combination of natural ingredients to aid the condition of the skin safely in the body while attaining safe results. 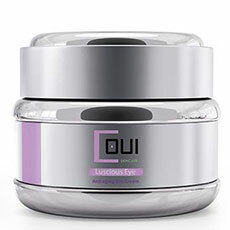 The company claims further that the cream may enable the eyes to see stunning conditions developing with time on the surface of the skin with continued usage in the body. How Does LUSCIOUS Under Eye Cream Work? The cream may be giving the claimed support in the skin via numerous avenues. To begin with, it is fast penetrating the skin in order to offer nourishment which is then allowing for ease of regeneration of new beneficial skin layers to enhance health. Further, it is also supporting the skin by offering enhanced lubrication of the skin to make the regions around the eyes to have better hydration and suppleness. These are seamlessly combined to offer the body better skin support. LUSCIOUS Under Eye Cream Ingredients – Are they Safe and Effective? Astaxanthin – This is enhancing the immune system in the body hence reducing acute inflammation reaction in the body . Lycopene – This is contributing to reduction of free radicals in the body hence. Beta Carotene – This is lowering the oxidation of other molecules in the body of the users of the cream. Glycerin – This is hydrating the skin condition of the body of the users . What are the Advantages of LUSCIOUS Under Eye Cream? There may be a boost in enhancement of the nourishment of the skin layers in the area around the eyes. The skin of the users around the eyes may develop better condition with no wrinkles and fine lines. The puffiness of the skin around the eyes and dark circles may also be eliminated. The formula is composed of natural ingredients to give better natural support. What are the Disadvantages of LUSCIOUS Under Eye Cream? There might be minimal elimination of dark lines under the eyes against the claims. The cream application may inhibit use of preferred lotions by some individuals. The cream may react differently with varied skin types of the users. How Should You Use this LUSCIOUS Under Eye Cream? The cream should be gently tapped with the tip of the fingers of the users under the eyes gently until well-absorbed. How Much Does LUSCIOUS Under Eye Cream Cost? The price of the cream is stated as $26.88 which is not inclusive of the shipping costs of the formula. What is LUSCIOUS Under Eye Cream Return Policy? There is no shipping back needed, provided the cream has not met the needs of the users, full refund shall be made. Does LUSCIOUS Under Eye Cream Offer a Free Trial? There is no offer of free trial of the cream. One may have to pay for it to enhance support in the body while using the cream. The cream is claiming to enhance the skin condition in the body by enhancing lubrication as well as moisturizing. Further, it may be contributing to a boost in filling in of the wrinkles and fine lines in the body. The body may also reap a lot of benefits from the nourishment of the skin cells near the eyes. The formula may, however, be facing some challenges with its use in the body. It might not give desired support for those who have grown too old. Users may also forego their preferred skin lotions during the period of using this cream hence may consider other available top rated eye creams on the market.